Mountain maze that towers over the Southeastern Pacific coastline of Chile. Estrecho de Magallanes. Glacially carved & capped peaks. Chilean Fjords. I stopped looking for whales. Porpoising penguins were merely brief distractions from the dramatic landscape that towers over the sea in a seemingly endless glacially carved and capped maze that is the Southwestern tip of South America. The raw coastal grandeur of Patagonia is one of the most overwhelming and wondrous stretches of landscapes I’ve ever laid eyes on. And only now, months after flying away, up and over the Andes range have I begun to process everything I saw. Stunning scenery from dawn to dusk. Chilean Fjords. Never before has a place equally inspired in me a sense of awe of both the forces of nature and those of human exploration. The geographic scale of Patagonia is (to put it quite simply) ridiculous! Sailing through the complex fiord systems, I continually found myself dumbfounded that any early mariner could navigate them. Antarctic-proportions of seabirds hover over and dive among kelp forests as rich as those of the Pacific Northwest, along a coastline of Norwegian-fiord vertical scale covered in beech forests reminiscent of New Zealand (but older and more diverse), all spread beneath a postcard alpine range littered with text-book stratovolcanoes. Overwhelming? Exactly. This is a place that posseses characteristics definitive of so many others, but because it is all of the them at once, is unlike any of them at all. A rookery of albatrosses. Cape Horn, Chile. Granite and skylights. Strait of Magellan, Chile. I didn’t sleep much over my time there, trying to take in as much as possible under the long daylight hours. Every minute revealed something different, the sun breaking through to light up features I hadn’t yet discerned from the rest. Ping-pong sized hail would be falling sideways one minute followed by crisp, calm blue sky the next. But when cloud curtains did completely cover the mountains, I was able to also marvel at small forms of life. Magellanic penguin stands out among the chaos & above the background noise. Punta Arenas, Chile. Penguin colonies dot the islands and outcrops of the entire Patagonian coastline throughout the austral summer. Having spent most of the year at sea, mature birds return to meet their mate, burrow, and carry out the energy-intensive process of raising offspring together. Space is limited, so birds must communicate either over the volume of surrounding couples and families or use exaggerated body language. Where the penguins can’t burrow, kelp gulls keep their nests, seeking safety in numbers from the egg and chick-snatching tendencies of their cousin skuas. Eventually, we rounded Cape Horn, leaving the Chilean fjords behind to tuck in behind the rain shadow of the Andes. 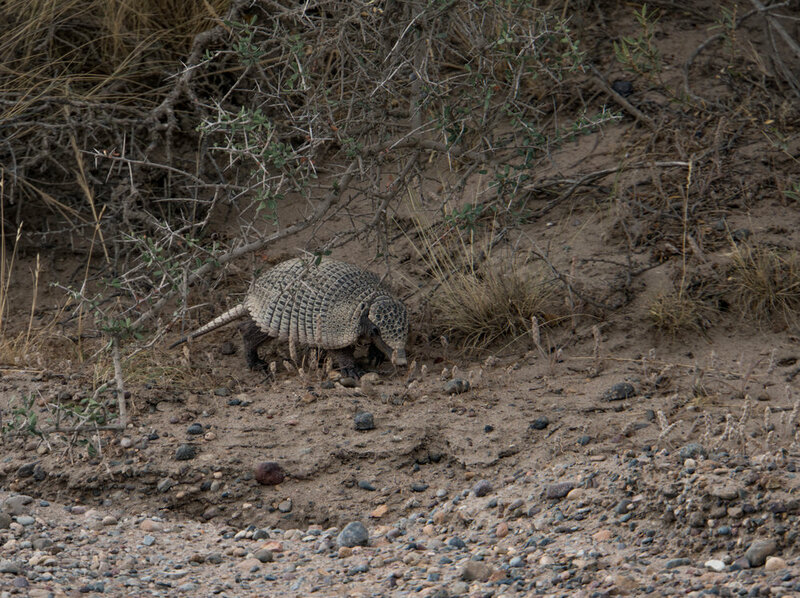 In Argentinian Patagonia, the landscape is less dramatic in the vertical, but horizontally it’s vast and contains uniquely adapted wildlife like armadillos and guanacos. I am not the first or only explorer to become infatuated with the stunning diversity of climate, landscape and resulting variety of flora and fauna found throughout Patagonia. The combination here is stunning, and while some diverse ecosystems around the world are vastly under-appreciated, this place has allured national and international travelers alike for hundreds of years. And the capacity for future admirers to fall in love with the place is growing rapidly! Twenty percent of the natural landscape of Chile is currently designated among the National System of Protected Areas, with more proposed in the exciting recent efforts to expand them. Vast quantities of protected areas are appealing on a map, but for the public to truly appreciate their worth, they must be able to access them in some way. And that's what Chile has partnered with Parks Canada to do, to ensure the maintenance of these wild places while increasing the opportunity for people to experience them. Finding the balance between conservation and recreation capacity is the ultimate challenge with developing parks. The author of a recent article in Patagon Journal detailing this challenge in Chile aptly referred to when American national parks were first being developed and John Muir said "people are beginning to find out that going to the mountains is like going home.” However, this implies that to have this realization in a wild place, it has to be relatively comfortable for a person (why else are cruise ships the most popular and possible way to explore the Patagonian coastline? ), and each person's level of comfort is different. Cruise ship immersion in Patagonian landscape, accessed by inside ocean passage. Chilean Fjords. In our last few days in Chile, we visited Hornopirén National Park, with the intention of hiking the only trail found within the park. To say the trail wasn’t well maintained was a gross understatement, and we were turned around just a few minutes after we'd started. Had we all been better equipped as a group for the challenge and time it would take to slog through the muddy bogs and scramble over twisted roots, it probably would have been enjoyable. But like most other visitors, we were not prepared for that particular experience. Experience fosters connection. Without an adventure or even misadventure within the park, we didn't connect with it and it remains a less than memorable part of the trip. Peat bogs surrounding the drainage of Laguna Esmerelda. Ushuaia, Argentina. Wilderness can remain wild, while still being accessible. You have to be able to access that point where you are surrounded by it, fully immersed. The level of comfortable immersion is different for everyone, but it definitely lies beyond the park boundary and usually at least a kilometer from the trailhead. Even for the most extreme of wilderness adventurers (and I’ve consulted with an expert on this one), every expedition is ultimately limited by access. And even the experts may agree they can’t value the unknown of a wild place without being able to get to it. 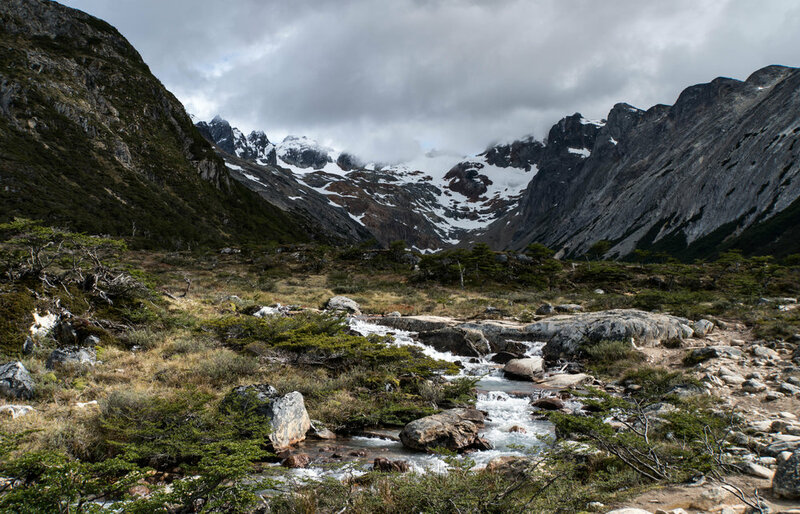 By contrast, Pumalin Park was one of the many protected areas in Patagonia readily accessed, that challenged us all to the varied limits of our comfort zones. We were completely surrounded with both grandeur and smaller curiosities; and those experiences we now cherish instilled in us its value. Volcan Chaiten. Pumalin Park, Chile. Nearly six weeks was really only sufficient to study scratches on the surface of this complex and deeply scoured landscape, but was more than enough to inspire an intense desire to go back, A.S.A.P. If you have the will and opportunity to go to Patagonia, do it. 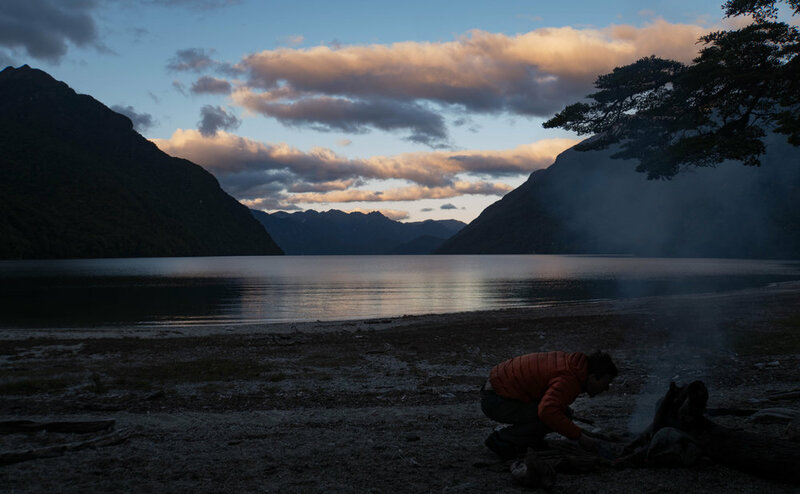 But travel responsibly; choose experiences that mindfully access the vast expanse of wilderness that remains in Patagonia, and (if you can) help fund the continued development and future designation of park land by the incredible conservation organizations driving these outstanding efforts. A moment that barely lasts long enough to capture. Beagle Channel. Temperate rainforests line the shores of Southeast Alaska's Inside Passage. If there was one word to describe the Nature of Southeast Alaska, it is “changing.” It is a place where Naturalists and ecologists alike come to know and value living models of dynamic ecosystems. From historic logging to retreating glaciers, a variety of disturbances expose a landscape to the earliest stages of ecological development, allowing opportunity to watch part of a landscape start from scratch or at least repair itself. But Southeast Alaska is also a place of cultural disturbance. 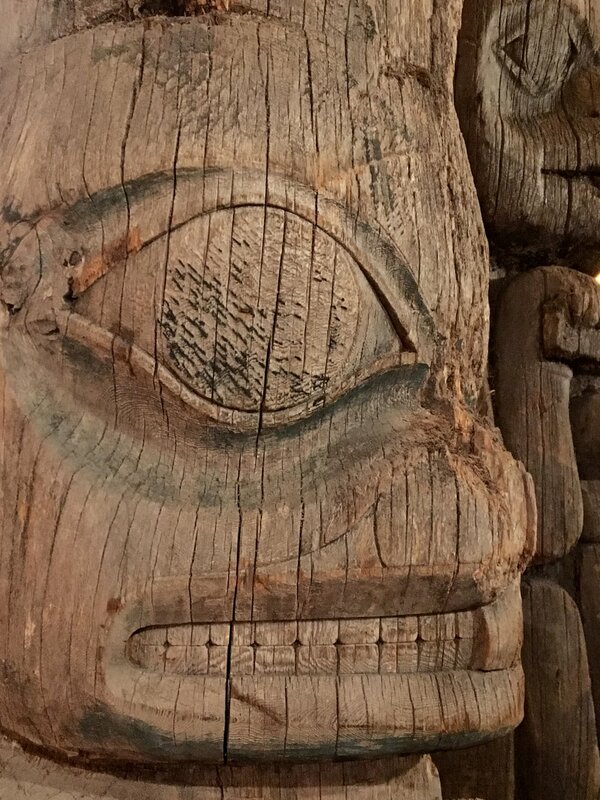 For the Pacific Northwest Coast tribes of Haida, Tlingit, and Tsimshian people, both the ecological and cultural communities were disturbed when the first Westerners made contact. And in some cases, the impacts of Western influence and colonization are described as cultural disaster. I am by no means an authority on these Native cultures, but it is difficult to escape taking note of something so deeply entwined with the landscape, also trying to reclaim itself. On the terminal moraines left behind by the retreating Turner (above) and Mendenhall (below) glaciers, forest succession begins with soil-forming lichens, mosses, and red alder, followed by western red cedar and sitka spruce taking hold, and finally the shade-loving western hemlock fills in the gaps. Like a glacial moraine sits uninhabited, seemingly lifeless for a time, the first steps of change go undetected. But tiny forms of life, most notably mosses and lichens clinging to the bare substrate are setting the foundation. Over time they will turn to soil suited for the plants that will eventually develop into forest communities. In a disturbed community of people, the process of rebuilding is even more complicated and takes more time. Last week, during my visit to Juneau's State of Alaska museum, I saw new roots taking hold. The majority of the place is a wonderfully chronicled and displayed account of the past. But the most striking part of the newly renovated building is stepping in to the present, in the form of a room full of modern art created by native Alaskans. In the exhibit titled “Decolonization,” the artists tell their personal stories, expressing a reclamation of a culture that is theirs. Comparing their work to that of their ancestors, who commemorated significant moments in time with totems, modern forms are not necessarily an attempt to rebuild exactly what was but to embody what is, in the wake of dramatic change. The future here has yet to be written. Art is a universal, timeless expression of cultural regimes. Totem Heritage Center, Ketchikan, AK. While I failed to grasp the meaning of many individual pieces, the concept of the collection as a whole reminded me of succession. Like the art itself, it is more abstract to characterize cultural succession than it is to describe ecological succession. But there are parallels. 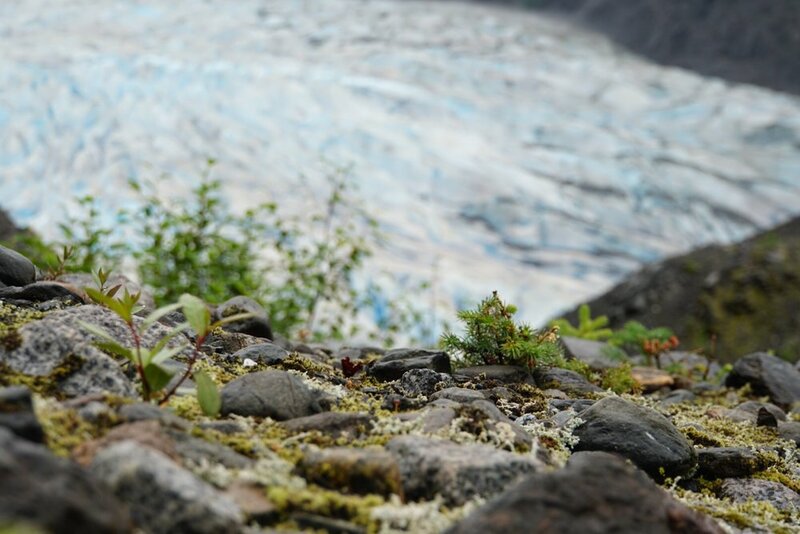 In a recovering ecological community, the early plants are called pioneers, “adapted to stressful environments.” Alaskan artists are like 'pioneers' that will ultimately set the foundation for the future of 'old-growth' re-stabilized communities of people deeply connected to this place. I still have a lot to absorb, but I will continue to take note of people alongside plants and animals as part of the interconnected communities that make up the dynamic ecosystems of Southeast Alaska. The melting pot of Manoa Valley. Oahu, Hawaii. It’s been over a month now that I’ve been here on Oahu, guiding hiking tours for visitors to the island. Despite the occasional native plant relic, virtually all of the sights and sounds of the forest are foreign. Along each trail we walk, a hodgepodge of plants and animals from all over the world allow me to tell the dynamic natural history of this special place. Native plants like this Ohia tree survive with the help of insect pollinators. Oahu, Hawaii. Hiking along the Manoa Falls trail, it’s particularly impossible to ignore the complex and varied songs of white-rumped shama thrush, which echo through much of the lower elevations in the Ko’olau mountain range. The ironic part about their presence is that these introduced songbirds gone wild here are currently threatened in their native habitat, where they are declining rapidly due to the pet trade. Grateful refugee, Copsychus malabaricus. Oahu, Hawaii. Here, the birds have found refuge and opportunity. But their opportunity has come about because of other unfortunate circumstances. Deforestation and the introduction of mammals to Hawaii drove the native forest birds the shama have replaced to the very limits of their habitat, and so the limits of their existence. The lowland forests of Oahu resemble nothing like what was experienced at the same elevations by the first humans to arrive just 800 years ago. Even on the highest ridges, the accelerated changes that have come with humans populating this isolated landscape are prevalent. Yet this false paradise holds a strange beauty, even to those of us who are not ignorant of what has been lost. At the Honolulu International Film Festival last week, the film Chasing Coral powerfully documented the rapid degradation of reefs globally through the use of time lapse photography. The film caused me to wonder about how to grasp the magnitude of ecological changes over a larger time scale. From the submerged Emperor sea mounts that span almost to Alaska’s Aleutian Islands, through the Northwestern Hawaiian Island fragments, and to the main Hawaiian islands, the Hawaiian island chain itself is like a time lapse image, each link representing a moment on a geologic timeline. In all this time, the most dramatic changes have occurred over a very small part of this scale, where the natural history of the islands meets its human history. But what this image also shows is that nature has a beautiful way of continually providing new opportunity for species to live differently than their ancestors. An island dies, a new one is born. A generation passes, the next comes forward. On the southernmost end of the chain, the timeline continues as Earth generates new land, a blank slate for plants and animals of all species! Our opportunity in the context of the future of Hawaii isn’t in the form of island homes or timeshares, but in choosing not to repeat the mistakes of the past. While on Oahu, we can arguably never ‘put the mongoose back in the cage’, on the eastern flank of the Big Island’s Kilauea volcano, new land is forming that has yet to be touched by any forms of life. The geologic timeline continues today. Kalapana, Hawaii. The success of a species can be measured by how well it adapts to the ecological opportunity inherent within the system in which it lives, allowing it to perpetuate. Living sustainably we survive and succeed to support coming generations of humanity that are equipped to do the same. We are a part of the natural history of this earth, and we have the capacity to use the knowledge and technology that we have gained from the past to determine the role that we play now and into the future. In a few million years, islands that are above the surface now will have completely dissolved into the sea. All that will be left of them when the newest islands emerge are things that passed on from one island to the next. Early opportunists. Big Island, Hawaii. I am incredibly grateful for the time I have here, not only to learn more about Hawaiian natural history, but also for the people I meet while I’m sharing it. Last week on one of my hiking tours, I met a wise and inspiring woman who asked me, “On your 80th birthday, what do you want people to say about your life?” Whether we make it even another year, we can choose to live every day with foresight not just of our future, but that of the world we leave behind. 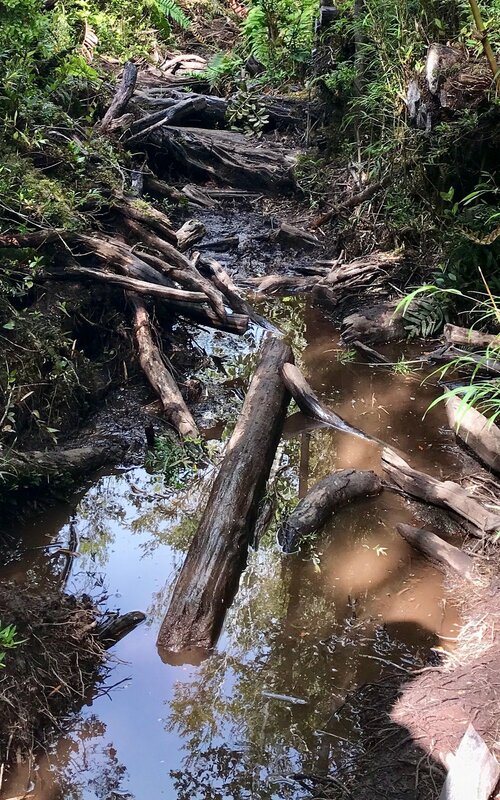 Will the next generations of hiking guides in the future forests of Hawaii be telling the same stories of our mistakes? Or will we have adapted to take advantage of the new opportunities in a new landscape, and instead leave a legacy of positive change? Humbled by the present. Kalapana, Hawaii. In an Australasian gannet colony, there are few gender roles. Cape Kidnappers, NZ. As a metaphorical tribute to National women’s day and a reflection of my recent experiences with the summer breeding season of several seabird species in New Zealand, I wanted to publish an image of a female seabird doing something amazing. But as I sifted through my collection of photos, I realized that seabirds are much more progressive than we are. The hard work of building a nest, incubation, and feeding requires teamwork. In a recent NY Times article about Blue-footed booby research, scientists have found that the key to these successful life-long partnerships is by mastering “the art of symmetry and turn-taking. [Male and female] spend the same time brooding and feeding the young, and expend the same physical effort as seen in measures of blood cells and body mass.” But such egalitarian parenting isn’t the full story. Not blue like the feet of their relatives, these gannets are still equipped to incubate. Murawai, NZ. Warm under mum or dad's wing. Dunedin, NZ. Guard duty. Taiaroa Head, NZ. All that work can't prepare for the chicks for circumstances that are beyond parental control. The chicks have to take flight, make mistakes, and face a whole host of obstacles independently. While in the human world we often attribute childhood success with good parenting, the same research that assessed the relationships of blue-footed booby pairs also tracked chicks into their adult lives. Interestingly enough, it’s chicks who experience a challenging upbringing that become the most successful as adults. An Australasian gannet downy chick awaits a feed. Murawai, NZ. It's been amazing for me over the past few months to witness the lifecycle of a variety of seabird species, and to appreciate that ultimately whether the chick makes it back to raise offspring of its own isn't a matter of chance, circumstance, or care alone. In reality, all of those things meet with genetics, opportunity, risk, trial, and determination. While visiting an Australasian gannet colony in New Zealand, one chick in particular stood out from the crowded scene. The top portion of its beak was deformed, likely damaged shortly after hatching when it was still soft. No matter how well the chick is looked after by its parents, it is very unlikely it will be able to forage for itself. But unaware of its disadvantage (or perhaps in direct defiance), its parents will continue to feed it and the chick will still try, driven by the inherent urge to step off the ledge into the unknown. When parental care is challenged by chance and circumstance. Cape Kidnappers, NZ. An Australasian gannet spreads its wings for the first time. Cape Kidnappers, NZ. Where we as humans find ourselves presently isn’t all that different. We can attribute both our successes and failures to a number of things, while recognizing that this life is a mixed bag. And with whatever we are, have, or encounter as individuals, we can choose to never stop trying to create the most opportunities possible with them every day. I continue to marvel at the complexity of life, especially things that can't be explained logically, scientifically, or even spiritually. The fact that seabirds can and do return from great distances to the same place they left years prior, like so many facets of life is simply amazing. And absolutely a testament to the strength of males and females of all species! Independent, but not alone. Cape Kidnappers, NZ. “Rooted in Discovery: Explore our space. Find our place.” That was the theme my master’s degree cohort took on and developed an environmental education program based from. To be stewards of the ecological communities in which we live, it was agreed, we need to ‘discover’ them based on experiences. Arguably most important to my role onboard is guiding the sailing experience through Fiordland National Park by providing commentary from the bridge of the vessel, and I wanted to add to that by creating a resource that would enable guests to take the experience and the information I share home: a documentary film. The best kind of hut access. Cedar Flat Track, NZ. Fortunately my adventure buddy was also keen on establishing his own apprecation and creating a film to encompass it for others, so we decided to arrive before the ship set sail (at least when we were scheduled to be onboard) to allow time to explore on land. The goal was simple: fill in the gaps of what we'd filmed at sea last year with footage from land. And what we came away with were experiences we didn't even know we needed and those we were looking for, we found in unexpected places. For example, fern forests in Westland invited us to wander beneath their prehistoric canopies, allowing our imaginations to see the Gondwanian relics that once did the same throughout New Zealand. What happened to the land before historic times? The changes have come in phases. Driving through Central Otago, it's easy to appreciate that the primitive forests could not coexist with the introduction of agriculture and pasture animals, features that overwhelmingly characterize the landscape today. To appreciate the impact of the more cryptic introduced mammals and the challenges of managing them, however, isn't quite so obvious. One of our last minute adventures of the trip was an overnight hike through the bush above Hokitika Gorge of the South Island's West coast. The track was full of surprises, including an excitingly exposed swing bridge that provided the only access to the camping hut. But the most significant one came as the day faded into the mist: an encounter with one of the biggest threats to New Zealand's forests. Australian brush possums consume an average of 70,000 tonnes of native vegetation every night in addition to a few documented invasions of native bird nests, and this individual (that would probably never reach this size in its native habitat) was just getting started. The place was difficult to access, giving an appreciation for the amount of resources necessary to put toward controlling such introduced pressure on the native landscape. Without this consumption pressure, introduced plants are hard-pressed to compete with the native flora that have adapted over time to the unique and variable climate that persists in Westland, but also notably in Fiordland. A day of sailing through the fiords can give an appreciation for this character, but the drastic changes in weather over short periods of time can also be found inland. Variable weather from Mt. Burns lookout. Borland Road, NZ. This was something we did plan to capture on film, and we found the exemplary scene on the top of Mt. Burns, which offered a view of the mountains surrounding Lake Manapouri. What made the experience all the more dramatic was the contrasting setting we found just 20 kilometers further along Borland Road on the shore of the lake's South Arm. The wind, rain, clouds, and cold we'd just came from seemed as far away as we felt from civilization tucked away in our own pocket of Fiordland, with just the company of curious New Zealand Robins. Deep in Fiordland. Lake Manapouri, NZ. Along the more beaten track of Fiordland National Park, we were greeted by other wild birds that, adapted to a landscape without them, have maintained their lack of fear of mammals. Alongside the Homer Tunnel that allows vehicle traffic access to Milford Sound, the world's only mountain parrot is often found thoroughly exploring the objects that are brought with visitors. In evolutionary time, these things are new to them, and the kayak on top of our van seemed exceptionally interesting. Speaking of our van, I should mention that to facilitate our inland exploration, we bought one. At home, we live and travel in a camper van, so it was only fitting that we find a surrogate. In a hurry, we settled on a seasoned Honda Odyssey. The purchase of a car should never be a hasty decision and is generally asking for some misadventure to ensue. The important thing is that it's still an adventure regardless. Needless to say, the van didn't make it to the end. On our last day, the CV joints that had been threatening from the time we made the deal, finally and completely broke. We were "bloody tourists stopped in the middle of the road." Misadventures are still adventures. Hokitika Gorge, NZ. Fortunately, people were to be a part of our experience too. We had just come from our overnight hike to Cedar Flat, where we had encountered the swing bridge and brush possum. But that evening, we also encountered a hungry hiker and his friendly dog. They were already cozy in the camp hut when we arrived. The young kiwi adventurers had been out in the bush since Christmas and were on their final night and very last of their food rations. We had brought an absurd amount of fresh food as usual, and were happy to offer some relief from the waning supply of dehydrated cuisine that had sustained our new friends for weeks. The next day, we hiked back through a torrential downpour to our van only to find a flat battery. Against amazing odds, another vehicle had ventured through the multi-gated farm road to the trailhead not long after our disappointing discovery and gave us a jumpstart. By this time the hiker and his mate had caught up to us and we gladly gave them a lift back to their car several kilometers away. What was intended as a free act of kindness would turn out to be a favor that was returned ten-fold. Just minutes after parting ways with the pair, they came up behind us dead stopped in the road. Against even greater odds than our previous rescue, they were headed to Christchurch too! Although their timeline wasn't as demanding as our early morning flight, with the genuine kiwi smile that I've learned is commonplace here, he offered us (and all of our stuff) a lift that evening. Misty beech forest. Grebe River, NZ. The three hour drive from Hokitika to Christchurch over Arthur's Pass was absolutely stunning. Cozy in the back seat with a dog in my lap, I smiled at the Jesus bobble bouncing in time to the road and the music of Led Zeppelin. I laughed at the irony staring at me, letting the noise and fleeting scenery drown the anxiety of the past few hours and the days ahead. It was a wild turn of events, but in the end was perfect. In good hands. Christchurch, NZ. Visting Mt. Cook at the beginning of (what I'm calling in honor of the van that was so integral to the collective experience) our 'New Zealand Odyssey', I participated in a survey about the day's visit there. But some of those questions now seem appropriate to apply to the whole trip. Sense of discovery? 10. Experience exceed expectations? N/A, we had no expectations. Challenging? 11. Would you come back? Duh. Recommend to other visitors? Absolutely. And that leads to another question: What is ‘my place’ that I found here in New Zealand? It’s conveying this deeper understanding gained to other visitors who may not have the opportunity for the same experiences. Helping more people come away from the experiences they can have with an appreciation of the value in conserving the unique natural resources of this place, but also (and perhaps more importantly) to inspire a desire to continually seek an understanding of the value in their ‘space’ at home. So we completed the film, and are now even more excited to share it!